There is a heightened sense of anticipation among salmon anglers and conservationists this spring. 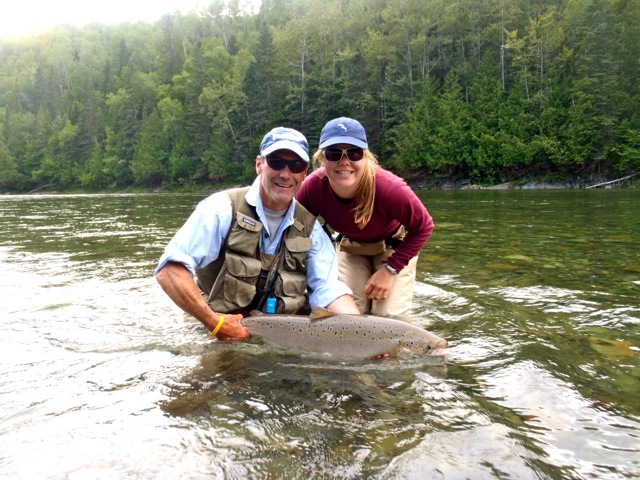 A new salmon season is upon us and everyone is eager to see if the steadily improving runs of both large salmon and grilse that ascended many eastern Canadian and Maine rivers the past few years continues. After hitting an all-time low in 2001, wild Atlantic salmon abundance has been on the rise with last year being the best in more than 30 years. Improved salmon runs and good water levels on most rivers last year combined for the best fishing (and catching) in a long time. And the most encouraging news is that scientists are predicting the improving trend to continue this year. There is no single reason or cause for the improved salmon returns, just as there was no single cause for the salmon’s decline. However, it’s obvious that the conservation efforts of the Atlantic Salmon Federation (ASF) are making a difference. Most scientists agree that improved freshwater conditions, much of it a direct result of the habitat improvement work of our dedicated volunteers, combined with better survival of salmon at sea are the major contributors to increased salmon abundance. My enthusiasm and optimism for wild Atlantic salmon is fueled by the strong leadership ASF is providing to the salmon conservation movement. The important role our Greenland Conservation Agreement, which has suspended the commercial salmon fishery there since 2002, has saved tens of thousands of large spawners that have returned to our rivers. Our smolt tracking research on the Grand Cascapedia, Restigouche and Miramichi rivers is shedding new light on smolt migrations and salmon survival at sea. And individual anglers are doing their part by supporting local river organizations and practising live release angling. We should not underestimate the significant contribution we as individual anglers make by carefully releasing every large salmon and grilse we are lucky enough to catch. Last year anglers caught more than 91,000 grilse in eastern Canada and released more than 50,000 of them. Anglers also caught more than 40,000 large salmon, but killed 4,141 of them, all on Quebec rivers. We can and must do better. Last year anglers killed more Atlantic salmon than our First Nations and Greenlanders combined. If we expect other users of this precious resource to practice restraint certainly we must first practice what we preach. I know from my regular visits to Camp Bonaventure and Salmon Lodge that their outstanding guides and the conservation-minded anglers that frequent those two wonderful lodges understand and practice this. Best wishes for good fishing and successful releases.